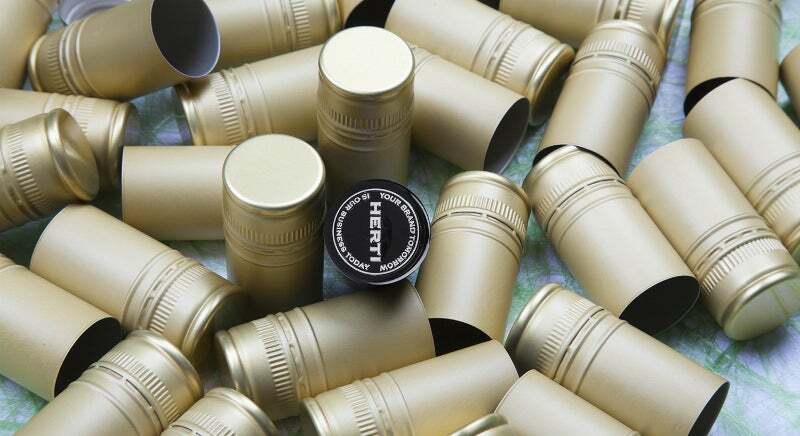 Herti is a leading European manufacturer of aluminium screw caps, plastic and composite closures for a diverse range of bottles used throughout the food-processing industry. Practically every conceivable dimension of aluminum closure can be manufactured by the company, which also advises on packaging solutions to clients producing wine, spirits, non-alcoholic beverages, olive oil and pharmaceutical products. The company focuses on creating innovative solutions in accordance with its motto: ‘Your brand tomorrow is our business today’. Close collaboration is provided to clients at every stage of development of their products and brands, combining unique design and high-quality appearance with functionality. Aluminum closures form a large part of the visual impression of bottles and their branding. More than 40 closure size types are available from Herti, covering 90% of all aluminum closures on the market. Closures featuring the HL sign are delivered precisely with consistent quality to more than 50 countries globally. No compromises are made on quality and safety, with every stage of production strictly controlled and only certified raw materials used for products. The company aims to continuously improve its products and processes to ensure the highest quality. Aluminium ROPP closures are available in diameters ranging from 17mm to 43mm, and heights from 12mm to 6mm. They are used to seal bottles with capacities from 50ml, right up to 1gal. Aluminium closures are widely used on bottles for spirits. However, closures with dimensions 31.5mm × 24mm and 31.5mm × 44mm with olive oil pourer liners can also be used for sealing olive oils, while closures with dimensions of 28mm × 15.4mm plus PVC compound are used for bottling carbonated drinks.. When it comes bottles to water and soft drinks, Herti aluminium and plastic closures are available in dimensions such as 28mm x 15.5mm; 30mm x 25mm; PCO; BPF; 48mm x 41mm. The company also provides plastic handles. Herti’s most recent innovative addition to composite closures in this market is called DORADO, which is an aluminium closure featuring a plastic safety ring that is tamper-evident and protects from injuries. This product has been designed for capping high and middle class water bottles in both still and sparkling varieties. This solution is suitable for ozone and sensitive waters as the compound it uses is PVC-free. Raw materials used to manufacture plastic caps meet EU regulations that guarantee origin and have organoleptic characteristics. Herti’s plastic articles complement its aluminum and plastic closures, making them a flexible and visually pleasing solution for a variety of uses creating new composite systems and increasing their area of application. The company’s composite closures successfully combine aluminium and plastic components. They have been designed to ensure authenticity of client products. The closures can be customised by different technologies to best represent the client’s brand. Herti makes an effort to boost energy efficiency through regularly investing in the latest technology. Herti takes its commitment to the environment seriously as a SEDEX member and regularly reviews its material sources to ensure they are not only as eco-friendly as possible, but also meet ethical business practices. As an Ecopack partner and shareholder, Herti meets all principles for protecting nature and pursuing sustainability. However intricate a task may be, Herti has the expertise and experience to deliver the optimum solutions. To find out how Herti can meet your requirements, send us an enquiry through the form on this page or use the contact details below. Established back in 1993, Herti is now one of the leading European manufacturers of roll-on pilfer proof closures, plastic closures and articles, and composite closures. Herti composite closures provide greater safety against counterfeits by using a pouring system featuring various temper-evident characteristics, including an internal thread. Herti Deep Drawn Closures (HDDC) are intended for use when bottling spirits on high-speed bottling lines to ensure consistently perfect bottle closing during mass production. Herti Extra Long Closures have been optimised for use during the bottling wines and spirits. Herti is able to provide a range of plastic articles for packaging applications. Herti's versatile plastic closure systems can be used in a wide variety of applications. Herti Standard Closures (HSC) are versatile systems primarily used for bottling wine, spirits, still and carbonated water, juice and olive oil, as well as an array of pharmaceutical and cosmetic products. Herti provides its wine-designed aluminium closures under the 'Vinstar' trademark. WineWorks' new bottling warehouse in Onehunga suburb Auckland city, New Zealand, became operational in October 2016. Herti is attending the forthcoming Unified Wine & Grape Symposium in California. Herti will showcase its products at the forthcoming WIN Expo tradeshow in Santa Rosa, California, US. Herti has successfully passed recertification for its quality system and will work under ISO 9001:2015 for the next three years. Herti made a new investment at its production site for increasing capacity of 30x60 aluminium screw caps. Herti has celebrated its 25th anniversary, with several events marking the day. Herti is exhibiting at the forthcoming ProWein, a world-leading trade fair trade fair for wine and spirits ProWein in Dusseldorf, Germany. Herti is exhibiting its products at VINARIA - The International Exhibition of Vine Growing and Wine Producing in Bulgaria. Herti has established a new daughter company in the US. Herti has successfully passed recertification for the BRC/IOP standard, gaining the highest grade 'A' in the 'High Hygiene' category. From 19-21 March in Düsseldorf, Herti will attend the world's leading trade fair for wine and spirits, ProWein. For the first time Herti will exhibit its products at the Unified Wine&Grape Symposium in Sacramento on 25-26 January 2017. Vinitech is an international exhibition covering machinery, materials and production of wine and spirits, which Herti hasparticipated in since 2006. Herti is going to exhibit its products at the forthcoming events of Brau beviale in Nurnberg and Intervitis Interfructa in Stuttgart. 9700 Shumen, 38 Antim I str.